AUBURN, Ala. – The No. 10/10 Lady Vols (12-1, 1-0 SEC) shot a season-high 54.0 percent from the floor to claim their first SEC win of the season at Auburn (12-2, 0-1 SEC) on Thursday night, 78-69. The Tigers were led by Unique Thompson who posted a double-double with 19 points and 12 rebounds. Crystal Primm was their second highest scorer with 16 points, while Daisa Alexander added 13. Auburn started the game strong, scoring three points and forcing a turnover in the opening minute of the game, but Jackson answered, knocking down her first 3-pointer of the contest at the 8:52 mark. 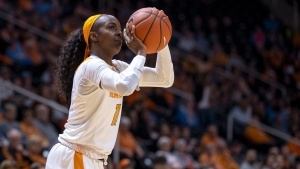 While Jackson scored from the perimeter, Rennia Davis found success inside, racking up seven points by the 4:28 mark to put Tennessee ahead 16-12. Auburn answered by closing out the quarter with a 6-1 run, taking an 18-17 lead into the second period. The Tigers went up by three on their first possession of the second stanza, but Jackson responded again with a trey to tie it at 20 before Evina Westbrook also got in on the action, hitting a three herself to put UT up 23-20 with 8:15 to play in the half. The Lady Vols went on to lead 27-22 before Auburn rallied back with an 8-0 run, taking a 30-27 lead with 2:23 to play in the half. Jackson again answered, nailing her third trey of the game to knot it up at 30-all on the next possession. Both teams added five points to their tally by the end of the period, making it 35-35 at the half. Tennessee took its first lead of the second half via a Davis 3-pointer just under two minutes into the third period. The teams traded buckets through the media timeout, after which UT launched an 11-4 run to go ahead 56-48 with two minutes remaining in the stanza. The Lady Vols maintained their eight-point advantage, taking a 58-50 lead into the final quarter. The Tigers opened the fourth with two straight threes by Erin Howard, cutting UT’s lead to 58-56 with 8:53 left in the game. Davis countered with an old-fashioned three-point play off a Zaay Green assist. Auburn rallied with a 6-0 run to take a one-point lead with 5:41 to play before UT hit back-to-back buckets to go up 65-62. The Tigers would reclaim a one-point lead off a Thompson layup at the 4:16 mark, but the Lady Vols replied with a 6-0 run and hit seven of eight free throws in the final two minutes to walk away with a huge 78-69 victory. Up Next: The Lady Vols will return home to host Missouri at 2 p.m. on Sunday in Thompson-Boling Arena. Children attending the game can enjoy Kids’ Corner at Gate F, with gates opening one hour prior to tip-off. Activities include free face painting, the Big Orange prize wheel, visits from Smokey and cheerleaders, crafts and more. 20+ Point Club: Meme Jackson fired in 27 points and Rennia Davis recorded 23 points against Auburn, marking Tennessee’s 11th and 12th 20+ point performances of the season. This is the third time both Jackson and Davis have scored in excess of 20, and Evina Westbrook has done so six times. The Lady Vols have now had a 20-point scorer in eight-straight games. A Three-Point Shooting Team: The Lady Vols knocked down seven treys against Auburn, moving their total to six straight games with seven or more 3-pointers. They have hit nine or more threes in four of those six outings. Big On The Boards: After out-rebounding Auburn 43-29, Tennessee has out-rebounded 11 of 13 opponents on the season. Lady Vols and Warlick in SEC Openers: Tennessee improved to 31-6 all-time in SEC openers, including 15-3 on the road. Tonight’s victory was UT’s 12th straight SEC-opener win on the road. Holly Warlick improved to 6-1 in SEC openers, including 4-0 on the road.